Sonic X has inspired so much new clothing, that it needs a page 2! Most of these items are by Top Heavy, and remain in the illogically too-small sizes unless otherwise noted. This is most of their Spring & Summer clothing selection. (A small part of their summer was on page 1) As you'll see, they begin by the end of the page to "catch on" and start making more stylish designs rather than slapping any image of Sonic or his friends that they can find onto a shirt and calling it quits. Again, the regular stores still apply: Sears Kohls and JC Penny. With this bright orange shirt, it's time for Sonic to have an 'expressions showcase' in the portrait squares. This one isn't as varied as the Tails one on the previous page, but it's still nice. As you can see, they're still releasing them with the bendy, and Bendy Amy is now on the menu so be sure to look for her when you go to buy these shirts. This is an odd one for summer...being as it has pants, a long-sleeve and quilted vest thing! But, it was released in the spring so here you go. 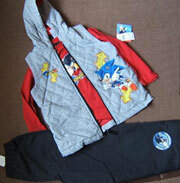 The jacket has Sonic, arrows and a quilted texture. The long-sleeve T shirt is the same design as the red sweat-shirt. 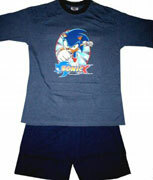 What makes the pants "Sonic"? We don't know. There should be an embroidered Sonic or "X" somewhere on them, but it's not in the shot. More primary colors, now with reflective strips! 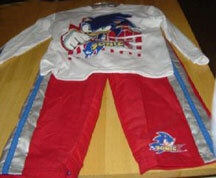 At least you can tell these pants are Sonic. 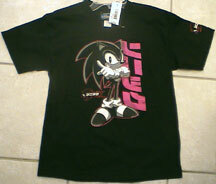 The shirt is a neat design, although it resembles the tags found on some of the merchandise. This is another Kohls item, and is usually too small to wear. Top Heavy is revamping their "Moving with the Quickness" T, by changing the color and andding sleeve logo. This is a navy blue one, but they are also in brown and black. This shirt is starting some kind of "Classic Revival" line with them, where they take old stock art, and attempt to make it look like it is from the 70's or something. More classic-revival here with "Supersonic" (although he's dissapointingly not super, in the picture) and a "Zoom" shirt with subdued-colors 1970s-style rainbow. The good news is, these come in REAL sizes. These shirts WILL fit you, they're not for toddlers like the other selections. Top Heavy is starting down the right path with this shirt. Sonic in subdued colors, and a stylish Japanese name beside him. 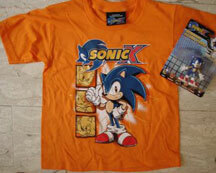 He is also bordered with red, and there is a Japanese Sonic X logo beside him, and on the sleeve (in orange) The art may be stock from X, but it's presented in a subtle manner that does not just seem "slapped on for the kids". **This is a reasonably sized shirt! It is never "too tiny" and comes in sizes likely to fit you, be sure to pick it up if you want it! The red is actually a neat, shiny reflective paint, but it does not show the luster in the photos. Sonic and Shadow sneakers with a black and gray theme. These feature stylish plastic overlays with little holes for breathability. Double strap velcro tops seem standard, but yellow borders add some interest with the generally dark design. Plus, Shadow! More Sonic and Knuckles theme shoes, this time with full body action poses as thick plastic on the sides. Also a new feature, is the Sonic X head symbol on each of the strap tops. These should be available at WalMart, but finding a size large enough for your foot (if you are reading this page...) may be somewhat difficult. Remember, these are standard kids' shoes, not the sporting ones that come in better sizes. They are not WalMart exclusive, but it was still your best bet to find them. They were also sold at "Gabriel Brothers" a store in the N.E. of the USA. The familiar 'flying at you' Sonic on a black background. The Sonic X logo is in Japanese this time, to add a bit of mystery. 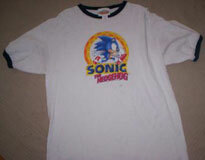 It should be noted that this shirt design is EXACTLY the same as the "Super Sonic Speed" one, but without the slogan, or glitter. The design is also slightly larger. If you want something more subtle, then this could be your shirt. More with style! 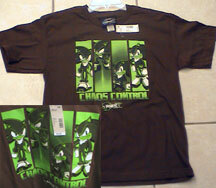 This Shadow Chaos Control Tshirt has 4 bars with semi-shaded Shadow portraits, all in hot green. The green paint used for this does not photo well, and is actually not yellow-green, but more flourescent mid-green. The shirt, is unfortunatly a dark brown, rather than black, and so does not compliment the green as it could. Still, this is a cool and unusual shirt, go to Sears to add it to your collection! This shirt may use old art, but the print is sophisticated with nice shading, and a checkered reflection on the 'ring'. The elastic bands for the sleeves and collar try to make it look sporty. This does not have a faked vintage look. This gray tee has a curious effect of "wet paint" that creates drips of color throughout the design. They're precice though, giving it a streaky look. The bottom says "Fast. Faster. Fastest." 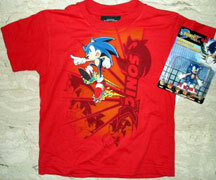 As of Spring 2007, Top Heavy Clothing seems to have figured out different types of people like Sonic. They have divided their shirts into 2 catagories, each with different designs. The designs do not overlap. They have shirts which are for really little kids, and then shirts for everyone else, in nice, reasonable sizes. This is a good move, and shouldn't isolate any of the fans. Here's another bright orange one, this time with some flames and a logo. 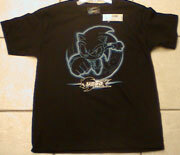 The art style of the Sonic on this one is quite similar to that of the "15th Anniversary shirt, which was also orange-ish. They're still releasing the smalls with bendies, but how much longer will that continue? 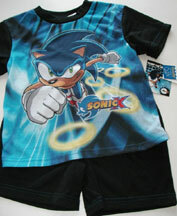 Here are 3 sets of Sonic X Pajamas. Two are characterized by having the designs dyed-on like the set above, but the long pants one has a plastic coated one. For all the variety of these pajamas, they are not that easy to find. Kohls, Sears or JC penny may have them. What are the sizes like? The oval is actually fairly detailed, and has not been used before this set. If you notice though...ALL the Sonics are the same in all 3 of these items! This design is bold with colorful quality background and flying power rings. The warmest of the set has a plastic coated detail. How well will it hold up in the wash? Red thread accents the seams. 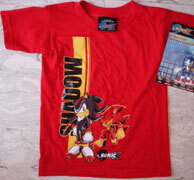 This one SEEMS to be a 'kiddie size' shirt, but it's pretty good looking for one of their smaller designs. Sonic seems to be concentrating among artful red flames, while outline versions of him in different poses run up the side. Did you notice? The SonicX logo is in Japanese! This is not usually something they do on the small size ones.